26 Jul 2018 --- “Health needs to be valued and understood as a journey with many different processes: Personalized nutrition needs to take that into account and put in the human side to scientific test results,” says Shai Rozen, CMO at Suggestic, a start-up that provides dietary recommendations based on user biology and AI. 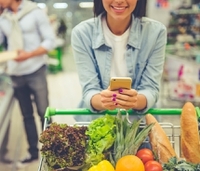 Tapping into the current surge of interest in personalized nutrition, Suggestic offers an app which can provide real-time, contextually-aware, hyper-personalized food recommendations – such as restaurant menu suggestions or recipe ideas. These recommendations are tailored to individual users according to an expanding array of user biology, coupled with artificial intelligence. A key aspect of Suggestic is that users can select their preferred diet/nutrition plan, after which it provides hyper-personalized advice, transforming the ever-expanding array of scientific knowledge on nutrition into actionable consumer suggestions. 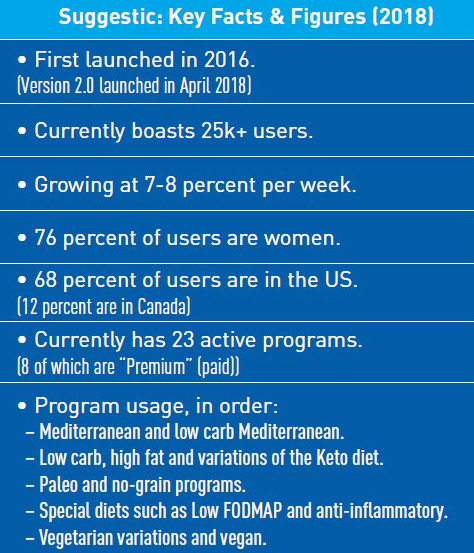 Click to Enlarge“Consumers are very moved by trends and in the past few months we have seen the trends of keto, high-fat, low carb, as well as growing trends in gut health and the microbiome,” Rozen says. With levels of primarily food-driven chronic conditions, such as diabetes and obesity, skyrocketing unabated for four decades since the first national dietary guidelines, consumers are losing trust in dietitians and official government-sanctioned nutritional advice, Rozen says. Instead, they are turning to alternative sources of nutritional guidance. “Food can be medicine, but it’s clearly been the opposite in our world. To enable food to become medicine again we use technology to provide the right tools, at the right time, for the right people: personalized nutrition,” Rozen explains. One of Suggestic’s next steps will be toward the growing trend surrounding digestive health. “The trend around microbiome is becoming more real. Whereas before companies were perhaps only offering testing, we are seeing more companies actually offering advice or products – such as pro and prebiotics – that are more personalized,” Rozen says. Despite some personalized nutrition endeavors coming across as “goal-less,” Rozen still things the industry is advancing at a fast pace. Despite personalized nutrition’s huge potential for growth, challenges still remain, especially for a startup such as Suggestic. “The largest hurdle for personalized nutrition [as a whole] is underpinning it with science. Nutrition is terribly weak as a science (certainly in relation to the other sciences), mainly relying on observational studies,” he notes. Moreover, finding the right focus or angle can be a challenge. “By nature, food is very imprecise. Food is food – it will never be the same as in a lab if you cook at home, for example. Each piece of broccoli is different; the nutrient profile could be very different. There are so many potential avenues to explore,” he says. However, the potential for smartphones to vastly reduce the cost of such studies is now becoming a real possibility,” Rozen concludes.